Brother Yun had a fifteen hundred year heritage. New Zealander Paul Hattaway is a missionary to China, so in writing a history such as this it is obvious that he knows what his mission is up against. Like his earlier book The Heavenly Man, Hattaway’s China’s Christian Martyrs tells the stories of individual men and women who put the gospel before their own comfort. There are Chinese of fifty-eight races, and Westerners of three continents: individual names and faces within the great cloud of witnesses that began with a dozen Nestorians in 635 and continues with millions today. Three quarters of the book is taken up by the twentieth century, almost half by the Boxer massacres. Several of the stories are of arrogance and interference; the consequence of outsiders favouring their own ways over indigenous ways, or the not always unintentional links between white-skinned missionaries and European colonial powers. Most of the stories are of otherwise-ordinary foreign Christians sharing the good news of grace with groups occasionally unwilling to listen, and of the resolve and resilience of the local believers. This book is fast-moving, engaging, easy to read, and lends itself to using a story or two as an aid to meditation. The individual testimonies are inspiring although at times Hattaway uses martyr-jargon like “promoted to His Glorious Presence” which distracted me a little bit. The take-home message is that Christ is coming with grace for another beloved ancient people, and he is doing it from the inside. Maoist China doesn’t stand a chance. “Falling in love with the God Jesus knows.” That sounds wonderful doesn’t it? This is one of the books I have been looking for all my life and I am pleased that it is but the first in a series of four books exploring a practical spirituality for twenty-first century local churches. 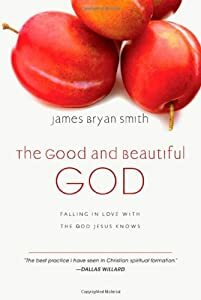 Smith confronts the false narrative that God’s love is based upon our efforts to “try harder” or “be good”, instead presenting a God who is good, holy, trustworthy, generous, self-sacrificing and transforming. The God of Smith’s experience created women and men to enjoy God above all, and to live in a relationship of love with God that fills all corners of their lives. Books to follow in the series will deal with a “good and beautiful life” (living a transformed life in the face of issues) and a “good and beautiful community” (living the good and beautiful life in public). This would be an excellent resource for small group study as it includes group reflection and discussion questions along with a weekly “soul training” task for individuals. Eleven. Of the 25 books presented here in summary I had previously read 11, and I still don’t consider all them must-read. Thirteen editors, many of them authors, made up the editorial board and each offers his or her own “top five” through the course of the book. Many of the books on these lists are not by Christian authors yet suggest Christian themes; other books appear on more than one list. This is a readers’ book and as such I had as much fun in debating the list as I did in reading the top 25 itself; yet it is also a devotional book and is designed to be thought through and reflected upon. Each of the books, from St Benedict to Bonhoeffer and John Calvin to John Bunyan, is presented with an introduction to the author, the book’s place in history, and a guide on how to read it. Following the excerpt there are study questions designed for both small-group discussion and personal reflection or journaling. The final section provides a summary of the best contemporary authors, including some of the editors, (Richard J. Foster) alongside such names as Brian McLaren, and N.T. Wright. Only two of the featured authors are women, but that may have more to do with church history than editorial bias. I enjoyed dipping in and out of the excerpts and am looking forward to finding some of these books to read in full. This is me and my parents outside our new church in Kingscote. Bring on the next three years of mission!